Chickpea flour is one of those wonderous miracle flours. High in protein (6 grams per 1/4 cup serving) and fiber (5 grams per 1/4 cup serving), and relatively low in carbohydrates (18 grams per 1/4 cup serving, only 13 of which are effective, after you subtract the fiber), it's an ideal product for anyone avoiding gluten or refined carbohydrates. I tend to develop junior high school crushes on ingredients. Sweet potatoes, kale, coconut milk, avocados, and chicken thighs have all been my jam (come to think of it, jam, too, has been my jam). Well, the latest stud on my culinary dance card is none other than chickpea flour, also known as besan ﻿or gram flour (the lattermost is not to be confused with graham flour, famously used in graham crackers). I first learned about it when my friend Andrew told me about a pizza crust he made with it. He said it was deliciously crisp and flavorful--not to mention tailored to accommodate several dietary restrictions. My ongoing curiosity about chickpea flour was recently satisfied on a Sunday trip to Vik's Chaat in Berkeley, where I like the food, but I ﻿love﻿ the adjacent Indian grocery store, with its affordable bulk spices, unique teas, outrageously cheap and delicious raw nuts, and fabulous selection of paneer. At Vik's, an enormous two-pound bag of chickpea flour could be mine for a song (OK, for $3). Chickpea flour is one of those wonderous miracle flours. High in protein (6 grams per 1/4 cup serving) and fiber (5 grams per 1/4 cup serving), and relatively low in carbohydrates (18 grams per 1/4 cup serving, only 13 of which are effective, after you subtract the fiber), it's an ideal product for anyone avoiding gluten or refined carbohydrates. It tastes nutty but light, and when cooked in a little bit of oil, become outrageously crispy on the exterior while maintaining a lovely tenderness on the inside. After much research and several flops (some of my attempts to make this literally flopped, and not in a good way) I have nailed what I believe is the most perfect chickpea flour flatbread around. It's somewhere between naan and a dosa or crepe. Serve it with curry, soup, creamy greek yogurt for dipping, or eat it on its own. I promise, you, too, will be hooked. 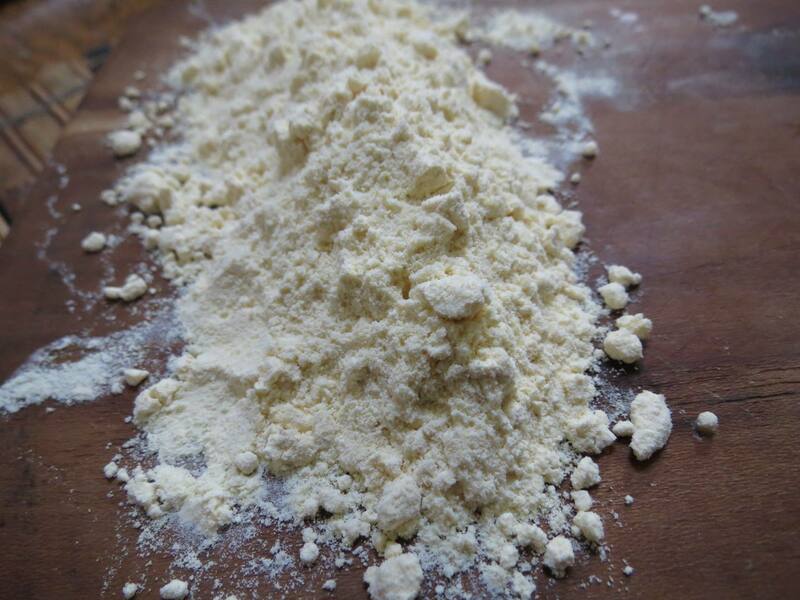 1/2 cup chickpea flour (besan) $3 for 16 oz. Sift the chickpea flour and salt together into a mixing bowl, using a sifter or a fine mesh strainer. Whisk in 1/3 of the water, to form a thick paste, making sure to eliminate all of the lumps. Whisk in the remainder of the water. The batter should look and feel like thin pancake batter. Stir in the cilantro and chile flakes, if using. Heat the olive oil in a large nonstick frying pan over high heat. Pour the batter into the pan, jiggling the pan a little bit if necessary, to help the batter spread. Cook the batter for 3-4 minutes, until it becomes firm, and the bottom turns golden brown and crisp. Carefully flip using the largest spatula you own, then cook on the other side for 2-3 minutes, until it also becomes golden brown and crisp. Remove from the pan, cut into wedges, and serve. How much water? The recipe doesn’t seem to say. 2/3 cup! Edited that. Thanks, Anne! Thank you for this recipe! I have this cooking right now, smells delicious. This has opened my eyes to a new tasty alternate and I would recommend highly, I’ve been adding chopped sun dried tomatoes and caramelised onions and different herbs to make the pancake breads fit with different cuisines. I have tried the recipe several times and the bread is never thoroughly cooked using a cast iron skillet. The virgin olive oil is not recommended for frying. The refined ( hot pressed ) olive oil has tolerance for heat. Made this for breakfast. Have been looking for alkaline breakfast bread. THIS WAS AMAZING. Will be adding this to my breakfast rotation. I did add a bit more salt, but overall was perfect. Loved the crispiness on the edges. Whew, just tried this, really needs a pinch of salt… And perhaps a pinch of coconut sugar… But it will work as a MUCH less expensive alternative to almond flour bread! With tweaks to one’s personal tastes, it works. Thank you for the recipe! Saw this and tried it, now use 1/2 chickpea & 1/2 wholemeal and make thin wraps for meat & veg/salad regularly-2-3 times a week. brilliant recipe, many thanks. 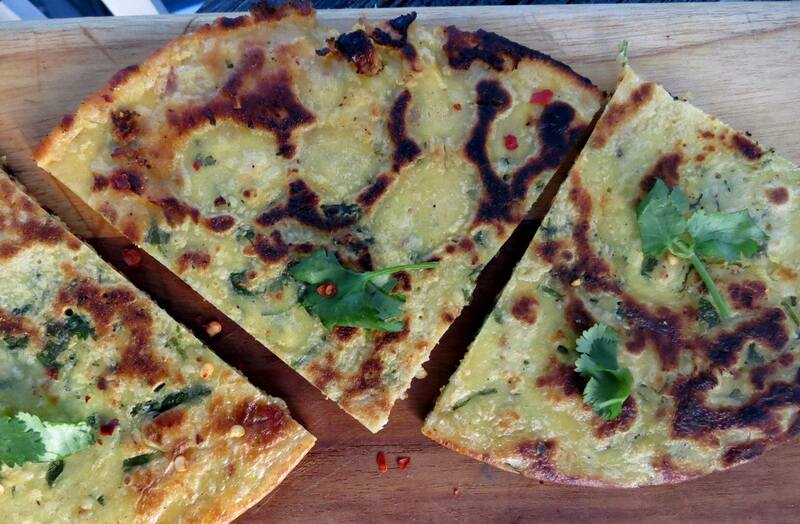 This chickpea flour flatbread recipe looks very great and it can served to kid`s as evening snacks after they arrive from school. The ingredients used in this are very simple ones and can be seen in any house kitchen. I would like to prepare this recipe in my kitchen and see how good I can do. You should try the Italian version. It is called Farinata and is a specialty in the province of Liguria. It’s baked rather than fried, but you use a lot of olive oil and it’s delicious! The only problem with chickpea-based breads is that they don’t keep well. So eat them up while they are hot! Flatbread? More like scramble. Stuck to my cast iron, well seasoned and greased pan like glue. Waste of time. This tastes great. Brilliant recipe. I made 2 very thin crispy flat-cakes from the recipe but only used one tsp of oil to cook each one, so 2Tbsp is not necc if you want to watch fat intake. Used a bit of black pepper + salt to season the batter. Truly scrumptious and amazingly simple. Hi. Will be trying this today. Can they be frozen? We should always pay attention while searching for the clash royale gems that the free gems will be used or unused. Absolutely delicious, thank you thank you thank you! The most easiest way to get this game is here also you can play this game free on your mobile phones and desktops ,also you can play this game directly on your phone that mean there is no need of downloading the game . what is different betwen flatbread and pizza? Really awesome recipe i really need that kind recipes i gonna bookmark you please keep sharing. Its very nice post and helpful for.Glad to be here,lot of things are here to explore.I gonna bookmark you and please keep posting. Bought a bag of Bob’s Red Mill Chick pea flour and have been dying to use. I just mixed up very little with water to pancake batter consistency. I didn’t let sit very long because I was hungry. I drizzled a little avocado oil in nonstick pan. Made one small pancake size flatbread. Spread basil pesto and topped with arugula and grated fresh Parmesan . Baked til cheese melted. Perfect little snack/lunch. Love this flour!!! My daughter is doing a charity fund raiser living on the rations given to refugees for a week to raise $$ to support refugees. We found your recipe for the chick pea pancakes/flat bread and made it in a blini pan and it turned out fabulous. Thanks for the great idea regards Libby from the Blue Mountains in Australia. Super easy to make, I have just made two batches for afternoon tea and it went down a treat, the kids loved it. Such a confusing but appealing ingredient- I eat chickpeas roasted and I love hummus. I tried this recipe grilling several different consistencies and wanted my final product to be a little fluffier. I found the solution by using soda water from the soda stream! It worked great. We found your recipe for the chick pea pancakes/flat bread and made it in a blini pan and it turned out fabulous. Thanks for the great idea regards Libby from the Blue Mountains in Australia. it will certainly be a feature on the first day for the video game, when it introduces worldwide on September the entire gamer body system from previous NBA 2K iterations. Nice post. I find out something totally new and challenging on websites I stumbleupon daily. It will always be interesting you just read material from the authors and practice something from other web pages. computer game and so forth without cost Leo Playcard is most likely the most suitable software for you games to hack the usage of Leo Playcard without price. Many thanks for your great words about this post. Thanks for sharing this awesome tips..
You could likewise make in-app acquisitions free of cost, regulate those bothersome advertisements, also if you intend to change some applications utilizing Lucky patcher after that additionally you can. The recipe doesn’t seem to say. Epson Printer presents a sophisticated range of functional features that comes unique to any other printer creation. If you are getting any issue within its services, then connect to the determined technical team at Epson Printer Help Number UK 0808-238-7544 toll free. Any thoughts on using this as a pizza crust? I keep returning to this recipe. I love it. Thank you. I love the taste, the ease and simplicity of this recipe but I can’t seem to get it out of the pan except in pieces …more like a scrambled egg. Desperate to nail this so has anybody got and tips? Tried cast iron skillet and ceramic frying pan. Not every tracking print job software can provide you enough information. You have to consider some point to extract correct data from it. This blog explain correctly how tracking print job can save you a lot of money. You can analyze who is using your printer for their personal use without informing you. There is a possibility that your HP Printer stop responding out of the blue because of technical reasons. But if this happens, then don’t panic as we are here to serve you with its solution. Call us at HP Printer Customer Care Number UK at any convenient time. Great find! Working the Paleo Diet this summer and this is Chickpea Flat Bread recipes is PERFECT for my Pinto Bean, Garden Greens, Breakfast Burrito. :) Ciao from lovely, rainy, Sointula, BC, Canada! At times, user feel stuck with their printing task as their Canon printing machine stop working out of the blue. This can happen for different reasons but you can address this issue by following so basic troubleshooting tips. It can be sometimes as simple as restarting your Canon machine. AVG is a network of some confusing technicalities in the shape of an antivirus software that helps the systems running all over the world in keeping themselves free of all dangers and working smooth as per requirement of the users for any type of technical issue resolution contact AVG support system number uk. When mixing the dough combine the oil into the dough instead of so much water. Eggs besan flour salt oil, sugar if you wish. The dough should be oily and thick to touch it should return when poking with finger. Cooking should be attempted at very high heat…a tandoori oven operates at a very high heat compared to frypan. The oil content stops sticking. High heat assists with drying and expansion. Leave dough to sit after mixing. 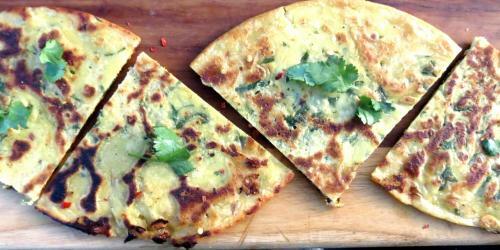 This is a fantastic blog on flatbread. The writers of software engineering assignment help appreciate your blog. How much time we have to heat it up. That’s what I need. thank you for sharing. Thanks for these awesome tips. It is full of information and is worth reading. I really appreciate your work. I love it! Very easy and healthy! My new way of making flatbreads! Thanks!